Our overnight bus from Bangkok to Chiang Mai was hideous. Let’s just say that the South Americans do long-distance buses much better than the South-East Asians. We had hoped to sleep on the overnight train but there were no seats or beds left – silly us for trying to get to Chiang Mai on the day that a reggae festival was starting. But, if we’ve learned anything about traveling with kids while traveling with our kids it’s that it’s never a good idea to let kids go to bed in the middle of the day – it just screws up bedtimes for subsequent days. A short walk around Chiang Mai seemed in order and hey, what was this “Monk Chat” thing described in our guidebook all about anyway? Over lunch we discussed questions the boys might have for monks and after eating, notebooks in hand, we went in search of some monks. Wat Chedi Luang is in central Chiang Mai and is easy to find. 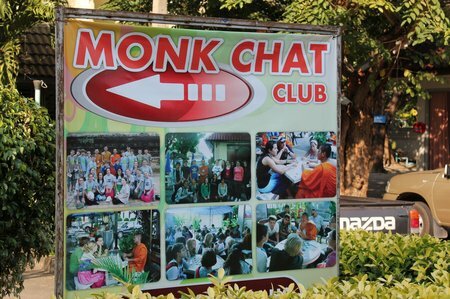 The sign at the entrance directs you to a group of tables in the shade where some monks are waiting for you to drop by so that they can answer your questions and they can practice their english. I could lie and say that my kids had an enlighted discussion about Buddhism but that would be untrue. Instead, they rather interrogated this poor monk about his day. By the time we left, they had his detailed schedule documented and seemed satisfied that this is a way of life they won’t be opting for any time soon. The monks, on the other hand, seemed to get a kick out of the boys’ directness and persistence. At one point, 3D puzzles were taken out to ease the conversational flow – perhaps by having the boys slow down to think about the puzzle rather than continuing with their barrage of questions. Unfortunately, CAM is a 3D puzzle master and the monks were clearly surprised – and maybe impressed – by his skill. Although, they were distracted by his looks remarking that he (CAM) was a Harry Potter lookalike, so much so that they asked if they could take his photo. Out came the cell phones and quick poses with “Harry Potter” were snapped. You really couldn’t make this up. 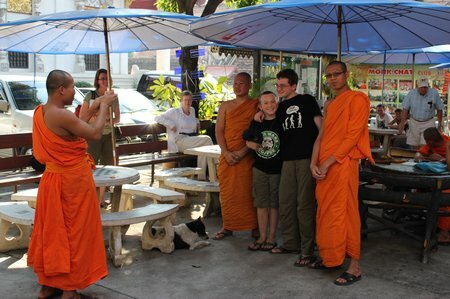 This entry was posted in International Escapades, Thailand and tagged Chiang Mai, Monk Chat, Thailand on February 1, 2011 by wandermom. What amazing experiences your kids are having, Michelle! What an interesting day! I’d love to do something like that with my girls one day …. I have done the Monk Chat too, just last January, such an enriching experience! Did you go also later in the evening for meditation session? I’ve been meditating every day since!